I was looking forward to hearing David Willetts outline his vision for the future of universities in Cambridge last night, and to the lively - perhaps even angry - question-and-answer session that would have followed. It's rare these days to find a politician willing to engage with an unpredictable and unscripted audience, and Willetts had promised to take questions for up to an hour. It was not to be. Before the universities minister had a chance to open his mouth he was interrupted by protesters reading out a long and frankly rather pretentious statement accusing the minister, among other things, of trying to "steal our honey". About twenty of them in all, seated strategically throughout the hall. Then they invaded the stage, as you can see below. Willetts left soon afterwards. Juvenile, pointless gesture politics, I thought. A piece of collective bullying by smug and self-righteous hooligans, ostensibly aimed at David Willetts but in reality targeting the many people who had come to hear what he had to say and indeed to challenge him. No free speech for them. After the activists been droning on for several minutes, a few audience members began asking them to sit down and give Willetts a chance to speak. They were ignored, just as the protesters claim that Willetts and the government have ignored them. Note to protesters: Not doing what you say is not the same as ignoring you. You can try to intimidate us; you can threaten to shoot us with rubber bullets; you can arrest us; you can imprison us; you can criminalise our dissent; you can blight a hundred thousand lives, slowly, and one-by-one, but you cannot break us because we are more resolute, more numerous and more determined than you. But there were no rubber bullets, although by the end I found myself wishing there had been. No arrests were made; no security guards appeared; no attempt was made to restore order. The surrender was total even before the moderator, Professor Simon Goldhill, stepped forward to announce that Willetts had gone home. They're still there. Apparently they're calling themselves Cambridge Defend Education. They've got a website and everything, and are planning to stay at least until next week, holding poetry-readings and impromptu activist training courses to while away the time. The usual stuff. The university authorities have still made no move to evict them, or even (according to Lorna, who is a research fellow in philosophy at King's and was deputed - or just volunteered - to speak to me) to ask them to leave. There has been no contact whatever. I'm told there are now around forty people there, taking turns to be on "door duty". When I went down there a lone security guard in a high-visibility jacket was wandering around outside, looking profoundly bored. H: Was it anticipated that Mr Willetts' talk would be disrupted or interrupted by protests, and were there any contingency plans for dealing with trouble? Had there been any negotiation with the protesters prior to the event? H: When was the decision made to cancel the talk and was it a unilateral one by Mr Willetts? SG: The decision to stop the lecture was taken by Mr Willetts and myself when it became clear that the handful of students had no intention of allowing any views but their own to be heard. H: Do you have a message for the protesters and/or a more general comment about what happened last night and what it might say about the debate on the future of universities? SG: I regard the form of the protest first of all as an extraordinary opportunity missed. Mr Willetts had agreed to take questions for up to an hour, and there were many of his most articulate critics in the audience. What a pity we could not see for once how these questions are to be answered. If the minds of the public are to be informed and changed, it needs proper public debate. Second, I regard not the fact of protest but the form of protest as an absolute abuse of the freedom of the university. The university is nothing if not a place for the free and frank exchange of critical ideas. This was an attempt to stop the exchange of ideas, and was done against the overwhelming wish of the majority of people in the hall. It was made in the name of the values of the university, but distorted and destroyed those values. It was politically not just misguided by giving all the strong lines to Willetts, but the sort of totalitarian behaviour that we all should hate. In the name of giving voice to their so-called non hierarchical and open views they refused to let anyone who disagreed with them speak. You cannot shag for chastity. Of course I wanted there to be an extremely robust rejection of what Willetts and his Government stand for in educational terms, but by rebuttal and argument. The students claimed very loudly to support critical thinking: what they showed was unfortunately reminiscent of the most extreme forms of totalitarian abuse of democratic openness. I also note that I have received dozens of comments from other students (and others in the audience) saying how ashamed and angry they were by this handful. 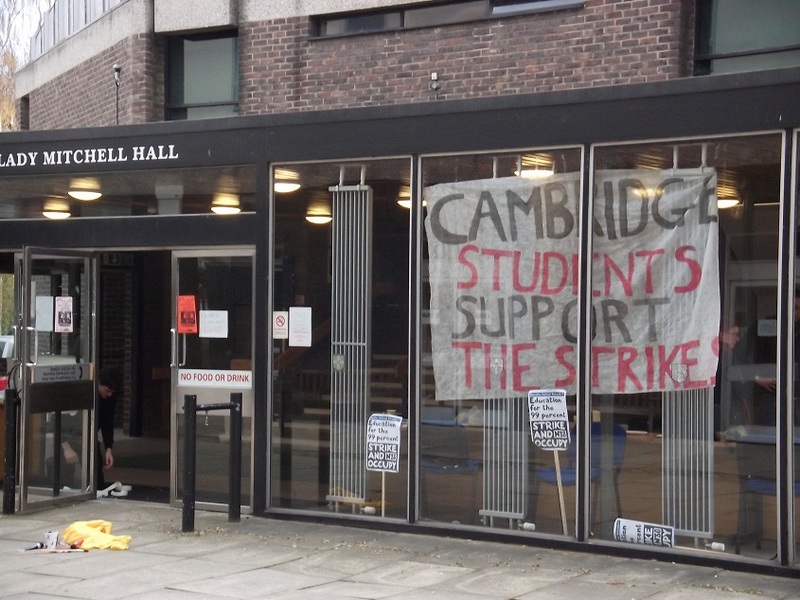 H: Writing for Varsity, Lawrence Dunn has described the protest as "sadly necessary"and writes: "I would-and I think Dr Goldhill would too- have been more embarrassed with the lack of political activism at Cambridge were Willetts' talk allowed to go ahead unimpeded". Do you have a response to that? SG: From the quotation you have given me, Mr Dunn shows the lamentable confusion in thinking that motivates the handful. Of course I am happy to see student protests: protest, as Naomi Wolf said in Cambridge recently, is a democratic necessity. But because protest as a notion is supportable, it does not mean that any form of protest is acceptable or productive. A political act that destroys the values it is enacted to support has been shown repeatedly by the history of the twentieth century as well as by any decent theory to be misguided.The word that most people have used in response to the event was "ashamed" -- ashamed of the protest and angry for the opportunity lost.